We challenge you to show loyalty and faith throughout your lives by creating and upholding positive and strong relationships within the community. On Tuesday, 5 February 2019 Merici College welcomed current and past students, parents, Jacqui Keighery, Merici College Board Chair, Minister Elizabeth Lee, ACT Legislative Assembly Assistant Speaker, Shadow Minister for Education, Shadow Minister for Disability, Shadow Minister for the Environment and member for Kurrajong, Margaret Cicolini, Catholic Education representative and Merici parent, Fr Emil Milat and Fr Josh Scott to the Opening School Assembly. The assembly commenced as the community processed through a smoking ceremony officiated by Mr Joel Bulger of the Ngunnawal people, who also led us in the Welcome to Country. 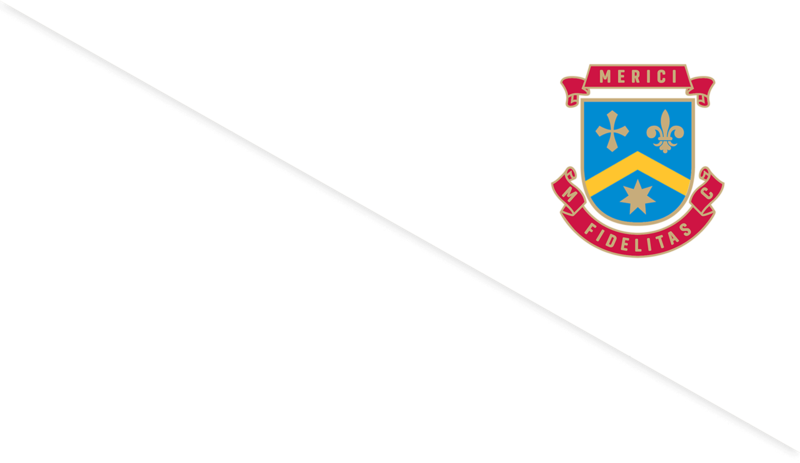 As a reminder to strive to be like Mary and Angela Merici, the symbol for the College this year is the Fleur de Lys. Fleur-de-lys is a French word where fleur means flower and lys means lily. This is a royal symbol and Mary, the mother of Jesus, is often shown holding lilies. The fleur de lys represents Mary and her purity. The first patron saint of the College was Our Lady of Lourdes, Mary. Therefore, the fleur-de-lys symbol is included to remind us of Mary and our first patron saint. The leaders concluded their address by challenging all the students to find resilience and courage in the spirit of Saint Angela Merici who saw women as significant individuals and agents of change, to be the best versions of themselves while further developing an environment within Merici that truly feels like a family. In celebration of Merici College’s 60th Anniversary this year, Mrs Wholley presented a historical timeline to the community and spoke about the different names the College has had. “The names discussed were St Patricks, Our Lady of Lourdes, Trinity, and to stop any controversy decided to go with Canberra Catholic Girls High School (there was even disagreement over was it a High School or a College). It was actually not a popular choice and got lots of criticism from the local church papers at the time for being boring and not having any connection to a Saint. But this was difficult given that 6 different groups of nuns, who had a connection with a different saint or vision or charism – it was not believed that they would be able to agree and they didn’t want to put one order of nuns as being more important than another. But the names continued to change and evolve with time. When Catholic Girls High School Griffith (now St Clare’s) opened it was necessary to drop the Canberra and add Braddon, then boys came along for a few years and so they had to remove Girls and then when they left the Girls was added back in. Finally in 1983, celebrating the Jubilee Year and the first lay (non-religious principal) Merici College was named. The community welcomed Ms Wanda Lawler and Ms Helen Campbell, both from the Class of 1962, who presented a reflection on their time here at CCGHS and unveiled the statue. We also thank Fr Josh and Fr Emil for blessing the statue. The statue was commissioned early last year and was completed by Engelbert and Isabella Piccolruaz. It is a similar statue to the one found at St Ursula’s College, Kingsgrove. His traditional wood carving and sculptures are executed on quality timber and left natural with a light coat of stain. The statue depicts St Angela Merici moving forward boldly and with purpose. She is holding a staff (or walking stick), this is signify her pilgrimage to the Holy Land. When they had gotten as far as Crete, she was struck with blindness. Her friends wanted her to return home, but she insisted on going through with the pilgrimage, and visited the sacred shrines with as much devotion and enthusiasm as if she had her sight. On the way back, while praying before a crucifix, her sight was restored at the same place where it had been lost. In her other hand she is holding a book – this symbolises her interest and dedication to the education of young women, particularly in the area of religious instruction. On this book is the Merici College crest. linking us forever to St Angela. Mrs Wholley expressed her appreciation to the many supporters who have donated to the Art Works fund (https://fundraise.merici.act.edu.au/) with all contributions having made a lasting difference and be a living memory to future students who embrace the vision and values of Merici College.